So I was walking and bouncing Adeline around for the 127th time today to get her to take a nap and I start to feel the weight of it....my dirty, disorganized house. I'm having some of my closest girl friends over to dinner tonight, so naturally I am trying to clean up a bit. But life starts getting in the way....I am getting frustrated at my youngest son for dropping his plate of lunch ALL. over. the. 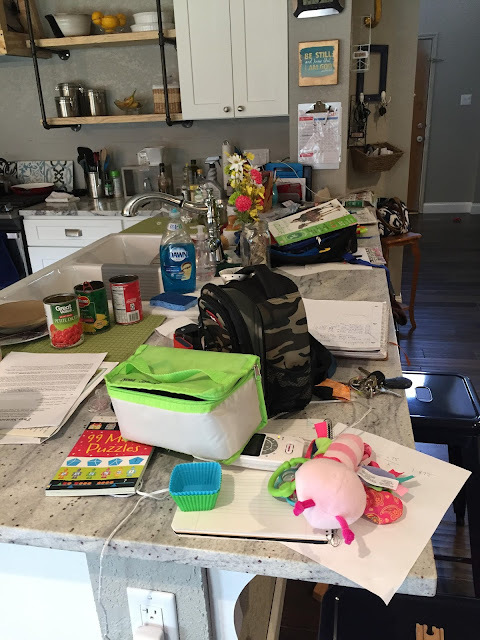 floor....my little girl who just WILL NOT nap today....and my oldest who bless his heart, has been asking a TON of questions about his schoolwork today. It adds up to one defeated momma, even before I can have my first cup of coffee. I struggled between wanting to just be a mean mommy all day, crying my eyeballs out and taking a nap (the nap almost won!). But then I started shifting my perspective as I started to pray. I thought about how manipulating our enemy can be, how he knows exactly the buttons to push, so we hide in the dark and feel the lies being fed to us. My anger soon turned to laughter as I realized the way we can be strong in the Lord is to expose our weakness for His glory and put our hidden struggles in the light. I have let shame run my emotions for too long and today, I'm hoping to gain a little peace and relief. 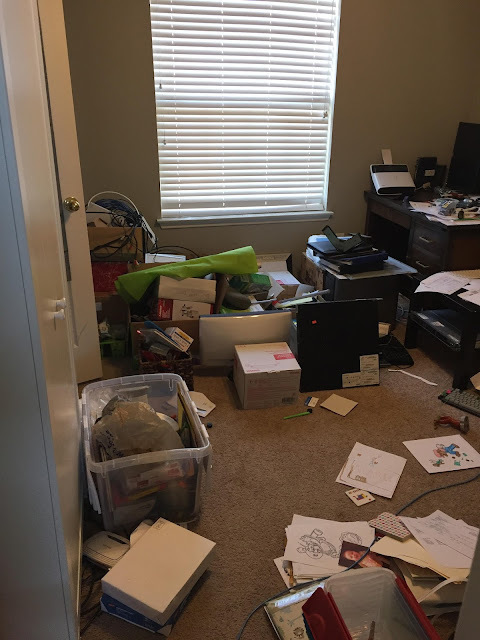 And not in an ordinary way, but I'm going to share some of my mess. And realize IT.IS. WELL. WITH. MY. SOUL. My mess is not WHO I AM, but rather a hopefully temporary (hopefully!) state of my environment. The lie comes when we believe whatever it is we feel shame about, is who we are, what defines us. The truth is we can be thankful for our weakness, because it's an oppurtunity to share His light and His glory with others. 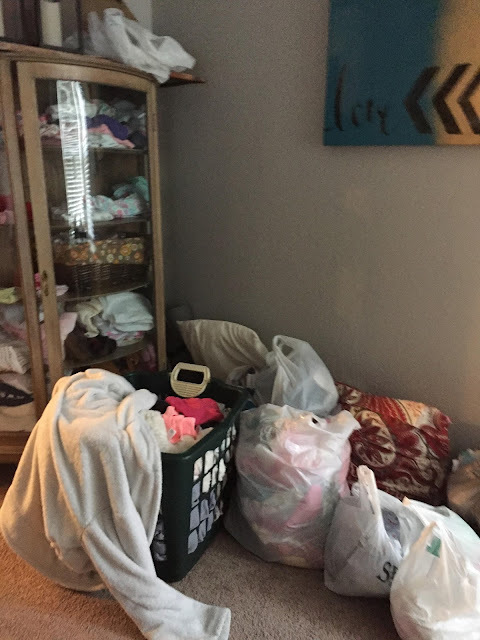 All these bags hanging out in the corner of my bedroom = BLESSED - it's all the clothes that have been given to us for Adeline (and clean laundry in the basket!) THANKFUL! 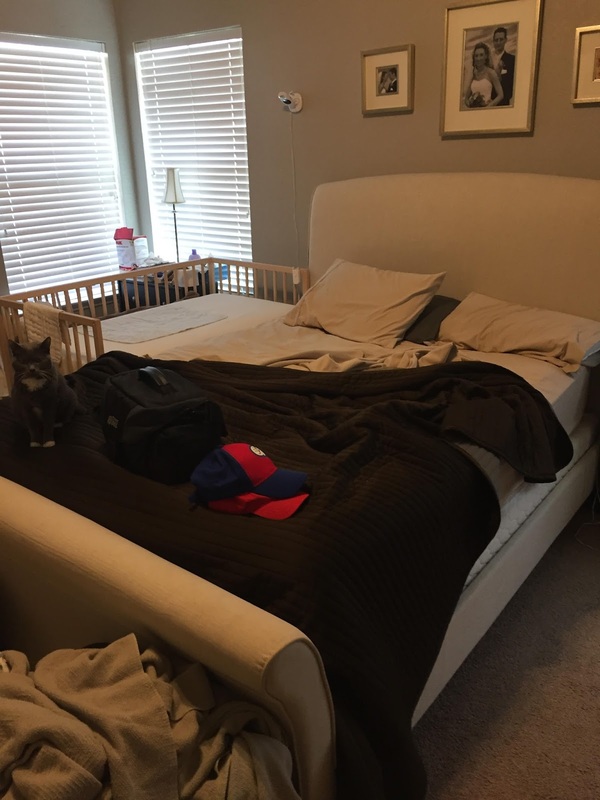 And un-made, messy bed, means I actually got SLEEP last night with a 3 month old. PRAISE to God! 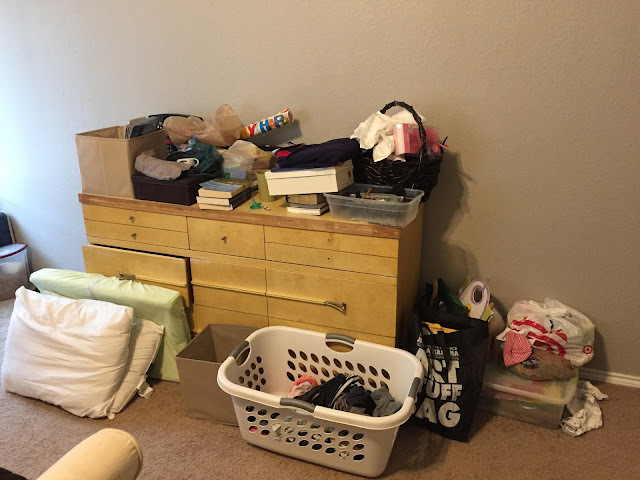 This is some unpacked odds and ends still waiting for a home in our new home we were blessed with last year = GRATEFUL for the BLESSING this home is to me and my family! This is our office....WHEW! This disaster is also a blessing because it means I have work to do. And BLESSED with a job I can do from home and be with my littles. GLORY to God! Underneath all that clutter is the kitchen of my dreams being built. And the mess on top is mostly from the little who are my biggest gift ever. THANK YOU Heavenly Father! 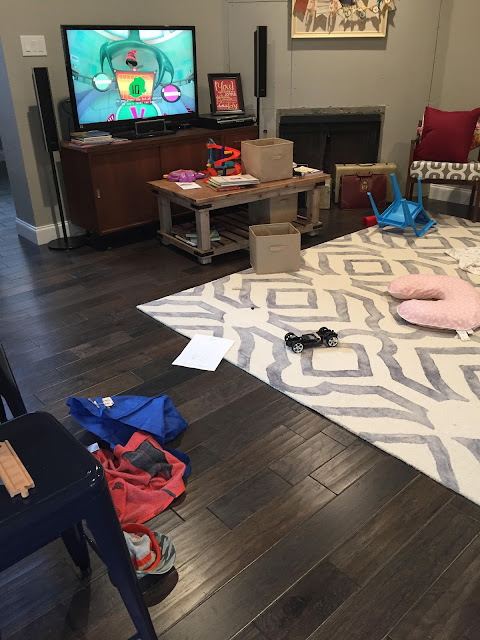 This unorganized mess is again, my kiddos, who I am so thankful they are curious little people who love exploring! And they are so creative using the gifts God gives them. And yes, LOVE Veggie Tales on T.V., which makes momma happy and keeps me sane! 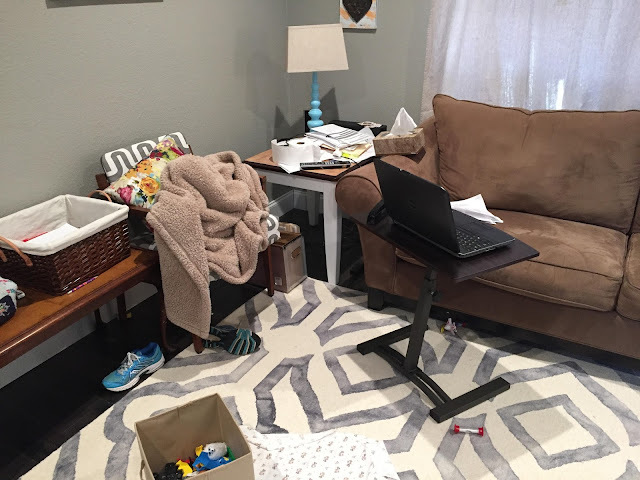 My little work station in our living room - Even in my busy season of life, I am thankful that I can be in the midst of such beautiful people, my family, everyday. I will continue to be grateful for all this seeming imperfection. I will boast in the Lord; the humble will hear and be glad. Proclaim Yahweh’s greatness with me; let us exalt His name together. Those who look to Him are[c] radiant with joy; their faces will never be ashamed. This poor man cried, and the Lord heard him and saved him from all his troubles. You who are His holy ones, fear Yahweh, for those who fear Him lack nothing.Young lion lack food and go hungry, but those who seek the Lord will not lack any good thing.